Weigh In Challenge: It’s crunch time. Summer starts next week, which means our Weigh In challenge is coming to an end. How have you been keeping up? Have you made any big changes since the challenge began months ago? Are you drinking more water? Eating more veggies? Getting your TLC fill while working out on the Elliptical machine*? If you’re a part of the challenge, email me your weight update for the second-to-last time. Ever. If you joined in the beginning, but fell off the weigh-in wagon, feel free to shoot me an email anyway, letting me know what you’ve been up to! It’s pretty obvious that being overweight isn’t the healthiest option out there. But a panel recently decided obesity is this century's single greatest public health threat. Sad, isn’t it? That we’re killing ourselves with cupcakes. Cancer, heart disease, strokes. These are all tangible threats to our health. But obesity? That’s a bigger problem. You can’t pick up a cigarette without the pack slapping you with a skull and cross bones. But what about that sweet, innocent donut? Is there a killer warning label on the side of the box? No – just some happy, bubbly, pink and orange font. Seems harmless enough. And it’s not all our fault that things have gotten out of hand. According to the experts, we’re being inundated with more and more unhealthy foods. “It is harder and harder to eat well," says Margo Wootan, director of nutrition policy at the Center for Science in the Public Interest. "For Americans today, healthy eating is like swimming upstream. It's not that you can't do it, it's just it's so hard. Without changing the food environment, people don't stand a chance of following the advice in the dietary guidelines." And now about two-thirds of us – and a third of children – are overweight or obese. 3. drink fewer sugary drinks. How do you cut calories without cutting out all the fun? *I swear I burn hundreds of extra calories just so I can watch the end of “Say Yes to the Dress” or “What Not to Wear.” Can you tell I don’t have cable at home? This entry was posted by kate, on Wednesday, June 16, 2010. You can leave your response . The title of this article is misleading. The article is about how obeisity is the number 1 health threat. Cupcakes don't cause obesity. Everyone knows that sweets should be eaten sparingly. Agree with 'other' Anonymous. Nice way to get people to your site but it's sneaky and disappointing. I agree with "Anonymous #1 and #2" Cupcakes aren't killers. It's the CHOICES that we make as individuals that are harming us. We have full control over our own health...and when you think about it, that's a beautiful thing. WE choose what goes into our bodies. 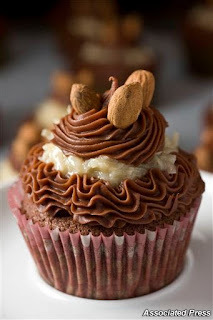 A cupcake once in a while is not going to kill ANYone. Seriously....cupcakes as your lead in?... "the sweet and silent killer" such BAD writing and lead into an article that has nothing to do about cupcakes. I agree with every post before mine! Very disappointing...next will be..."Birthday cakes...killing children everywhere!" c'mon! I can't help but agree with everyone else. The article didn't say much of anything really. I had a cupcake today... how many hours do I have to live doc? So sorry I've offended you. I was trying to put a funny spin on a serious topic and obviously that failed. You all make excellent points about eating in moderation. I will put more thought into the headlines I use in the future. Hey folks, I disagree with all of you. Everywhere you look in America you see fat people and if more of us had the mentality that cupcakes and ice cream and pizza were killers than maybe we wouldn't think size XXL on a sweaty fifth-grader is acceptable. Maybe this article was less about cupcakes than it was about obesity, but I am glad the cupcake bait was there because I learned alot and would not have clicked through to another article about obesity. I am glad I did. look, i love cupcakes as much as the next person. heck, i know a great cupcakery within lunch-break driving distance. doesn't mean i go there everyday. cupcakes are wonderful, delicious treats -- emphasis on 'treats.' unfortunately, people treat these 'treats' like they're a right, not a priviledge. thanks for the info, weigh in. i appreciate someone seeing through the frosting. These all kind of products contains lot of sugar and fructose that is always harmful to health and only increases weight! I feel the information you posted is a great resource and sufficient to understand the entire concept.The way you expressed is also amazing.Thanks for sharing.